The Nexus 7 tablet has only a front-facing camera and there isn't even a dedicated camera app. The message here is clear -you should use something else to snap pictures (like that smartphone you probably have in your pocket). Anyway, you could use the front facing camera to snap a photo or even record a video if you really wanted to. Google Plus Messenger, for example, can shoot photos (but not videos) and you can download an app from the market to enable the standard camera interface. Here's the kind of quality you can expect. Again, the camera does well enough for video calls, which are really constrained by network bandwidth not camera quality. Anything more would have needlessly driven the price up. The Nexus 7 tablet comes in two versions - 8GB and 16GB - but neither of them offers mobile data connectivity. For local connectivity, you get Wi-Fi b/g/n along with an unspecified version of Bluetooth. 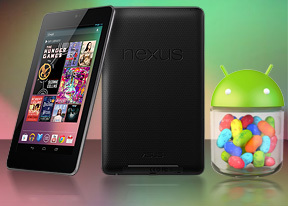 The Nexus 7 supports NFC connectivity along with the latest version of Android Beam, enabled by Android Jelly Bean. This enables simple transfer of images between two NFC-enabled phones and you can pair a Bluetooth speaker with a simple tap (if they support NFC, of course). The Nexus 7 also comes with a built-in A-GPS receiver, but this one isn't backed by a barometer like on the Galaxy Nexus (there it was used to get faster GPS loks). The microUSB port handles charging connections with a computer. You should note that there's no mass storage mode available, you'll have to use MTP instead. It works just as well for transferring most files but some files are a problem (e.g. hooking up the Nexus wouldn't show a .ZIP file we needed to copy off the phone). There's a standard 3.5mm audio jack for audio too. The Nexus 7 is the first device to use Chrome as its default web browser. That's right, the generic Android browser is not here. That's not such a huge loss though, as the Chrome browsers have been serving as inspiration for the Android browser for a while now. There are a couple of things missing, but we'll get to them in a moment. The interface is done in traditional Google minimalism. The tablet version has tabs on the top, it all looks a lot like the desktop Chrome browser, complete with the new tab button. You can also use sideway swipes to switch between them - the further you swipe, the more tabs you'll go through. When you open a new tab, you're greeted with a list of the most visited sites. You can also access your bookmarks from here or even tabs you have open on your computer (if you use Chrome there and you've logged in, of course). Incognito tabs are available, if you want to circumvent the browsing history and autocomplete features (e.g. you want to check your bank account or shop for a gift, without leaving any traces). The URL bar has a couple of handy shortcuts - one allows you to perform a voice search, which is quicker than typing, and the other is the star, which allows you to add a site to your bookmarks (you should be familiar with this one from the desktop Chrome). The settings menu includes some really interesting options. For example, you can set your search provider to be Yahoo or Bing or request the desktop version of a site. You can also allow the browser to preload links from search results it's certain you're going to open, but you can enable this over Wi-Fi only to preserve bandwidth. We mentioned some things are missing and you should have already guessed "Flash". Yep, Adobe announced a while back that they won't release new versions of Flash for Android past Ice Cream Sandwich. And Chrome doesn't even have an option to enable plug-ins, so even side-loeading the Flash player won't help. You should try a third-party browser or just live with the thought that you can only access the HTML5-powered part of the web. The other thing that's missing - at least we miss it a lot - is the Labs options, most notably Quick controls. They have been updated in Jelly Bean and have become even more awesome but Chrome on Nexus 7 just doesn't have them. The Nexus 7 lasted nearly six and a half hours in our browser battery test. That's plenty of browsing, but far from the official rating of 10 hours. Our automated test is more intensive than regular browsing though - you can learn more about how we do battery tests here. The Nexus 7 came without a preinstalled Office suite, not even Google Drive, which is a pretty capable editor. That's not a big loss - installing Drive from the Play Store takes only a few clicks. The calendar has a new look and its functionality is as good as ever. There are four views - Daily, Weekly, Monthly and Agenda. The Calendar makes good use of the bigger screen - daily and weekly views for example dedicate the top part of the screen to the day/week, while the bottom is taken up by a small monthly calendar, so you can quickly jump between dates. Similarly, the Agenda view uses a split-screen interface. The app can easily handle several online calendars as well as the local calendar. You can add multiple reminders for each event and search all events. The Clock app defaults to desk clock mode that looks a lot like the lockscreen. It might be of some use if you have a dock for your Nexus 7, other than that it's just a drain of battery power. The usual alarm functionality is still present - you can set multiple alarms, each with its own repeat time, ringtone and label. The calculator is slightly different from what we're used to as the advanced functions (trigonometry, square root, brackets, etc.) are placed above the number keys. Even with the extra controls, the keys are huge due to the big screen.